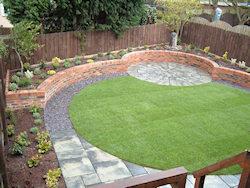 The Patio is probably the most used feature in any garden. Usually situated next to the house, you walk over it to get to the garden, you sit on it, you set out your table on it, you barbeque on it, maybe you even sunbath on it. Usable in all weathers it is an asset to any house, so why do so many look like council yards.? There was a time when options were limited to grey concrete slabs or horrendously expensive York stone. 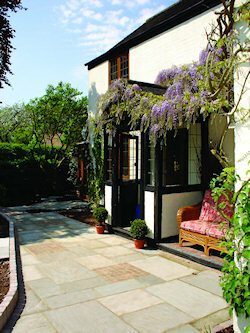 York stone is still expensive, but now, so are grey concrete slabs! Luckily we have sourced a massive range of Natural Stone Flagstones that won’t break the bank. From as little as £20 per sq. mt. you can have real, hand cut, riven Sandstone that will look fabulous for a lifetime, it won’t fade to grey, break up in the winter or crumble away like some man made alternatives. If you want something different we have Natural riven Limestone. Great for a sweep of dramatic elegance. Or perhaps Real Slate in sumptuous Copper or satiny Black. Re-live your Mediteranian holiday experience with Luxurious Marble or Exotic Travertine. Or perhaps a more rustic look with hand thrown Terecotta Clay pavers. Cutting edge design demands cutting edge products such as our sawn Sandstone, honed for a sleek finish or ultra modern Linear Paving for a contemporary look that will impress anyone. Or for that ultimate luxury, starting inside the house for the kitchen or conservatory floor and in one single sweep into the garden, we have polished limestone and the unique Fired Earth range of extraordinary flagstones. 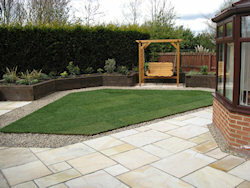 However big or small your patio is we have the paving to make it special.